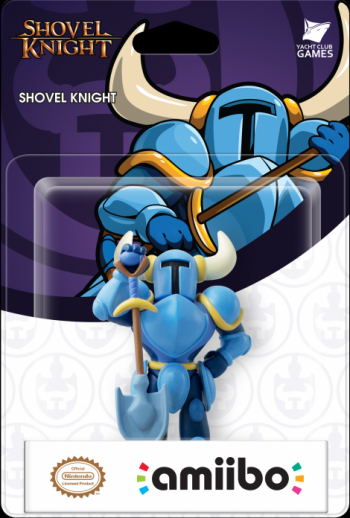 Looks like Shovel Knight's titular hero will be getting his own amiibo. "Today, we have the great pleasure of announcing a new Shovel Knight amiibo! Yes, it's real! We've been working on it for over a year! It's been quite the burden to keep it under our chest and our excitement in check," wrote Yacht Club Games on its website. As for what goodies the amiibo will unlock, there will be some amiibo exclusive challenge maps that take advantage of the new amiibo relics and abilities. It also has something to do with the Wii U exclusive co-op mode, but we are hoping that it won't be necessary to play the mode. "We plan to continue support of the Shovel Knight amiibo in future Yacht Club Games and Nintendo products," added the developer. "Stay tuned to amiibo.com for compatibility details in new games." Gotta congratulate Yacht Club - an indie developer, for getting themselves a merch deal from Nintendo themselves. Come to think about it, with Nintendo trying to push its "Nindies" angle lately, they should offer the opportunity to have your own amiibo as an incentive for other indies to hop on board. Shantae, CommanderVideo, Gunvolt... Sky's the limit, really. Whats the betting odds that this is going to be one of the rare (read: low manufacturing count) Amiibo's? I'd say the odds are not in favor of it being common considering the cooler Amiibos are the least manufactured ones. Dammit Nintendo, when Activision is beating you out in not being anti-consumer, you know you have a problem. (Note: Skylanders rarities are still easier to find than Amiibos). I like what Checkpoint stated on the Skylander/amiibo crossover thing. "Nintendo has finally found a way to keep up with amiibo demand: get Activision to make them!" It's probably already sold out. They'll probably be everywhere here, amiibos don't seem to sell to well here.